Yesterday was a beautiful spring day, and I was lucky to spend it with a good friend and her toddler. We had a delicious brunch at Gena's Restaurant. I haven't been there in a year or two but was a frequent visitor when I worked on the north east side of Columbus. I love their eggs benedict with well-done home fries the best, but every breakfast or lunch entrée I've ordered has been a treat. We ordered several things to split so we both got to have eggs, waffles, potatoes, bacon, and fruit. What a feast! My friend has been searching for vintage Fisher Price Little People toys for her daughter, and since I have a couple of old sets I was thrilled to pass one along. After watching the Toy Story movies I've always felt guilty about putting toys in storage. Even though I know they don't have feelings, it still seems a little selfish to put beloved toys in a box to keep for later. But what if I have grandchildren? I want some things to pass on. It was so fun to play with the Western Town with a kid again that I had a momentary pang about letting it go. It passed quickly, however, when I looked at her cradling the bag of people and horses and smiling. I think it also helps that I still have the complete castle set stashed away. chains and stacking rocks. I spent countless days just messing around outside as a kid, building fairy houses and playing make believe. Don't get me wrong, I had a Nintendo I'd worked long and hard to save for, but the idyllic days of summer vacation I spent roaming outdoors left a more lasting impression than finally beating Super Mario 3. 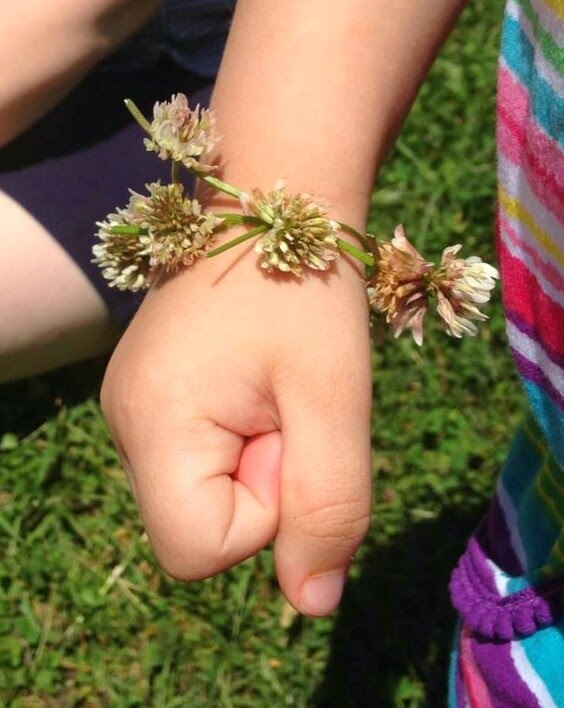 I was surprised to find my friend didn't know how to make simple flower chains, and gladly showed her the trick. 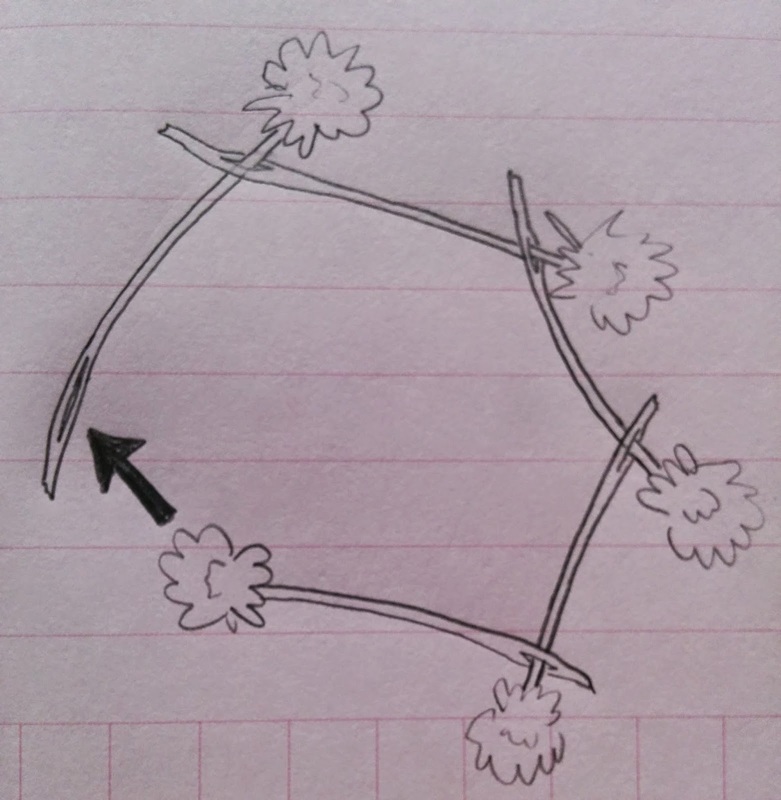 You just use your fingernail to make a split in the stem towards the end, and pass the head of another flower through. You can also make thicker braided wreaths, bracelets, etc., but this is the simplest and quickest technique. Her daughter was delighted with the result, and when the fun palled had a great time tearing it to shreds and casting them on the breeze. For some things, part of the fun is in the destruction. Happy chaining and watch out for bees!